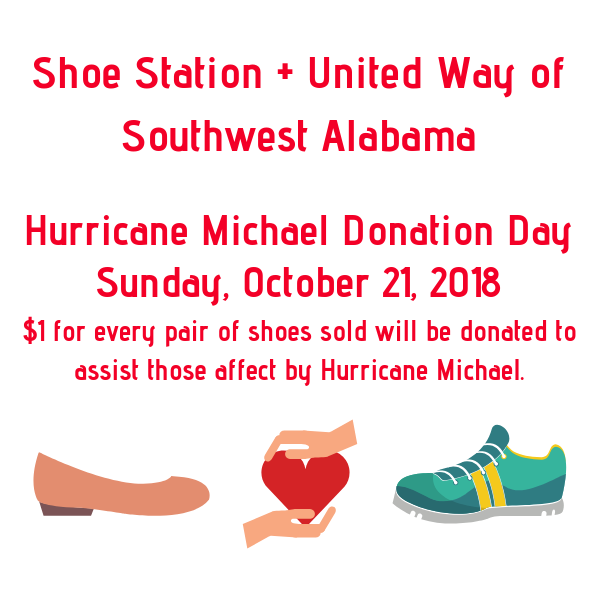 United Way of Southwest Alabama / Uncategorized / Join Shoe Station on Sunday, October 21, 2018, for Hurricane Michael Donation Day! The format of the fundraiser ensures that Shoe Station’s donation will increase with each pair sold, and there is no cap on the donation. Customers will also be given the opportunity to make an additional donation to United Way of Southwest Alabama. “We are pleased to sponsor this large fundraising effort for United Way to assist those effected by Hurricane Michael,” said Shoe Station President and CEO Brent Barkin.